Website Hosting and E-Mail Hosting For Rotary Dryer, Inc.
Jeremyn, a contact at Rotary Dryer, Inc. got in touch with us about a month ago asking about our services and offerings. They noted that they were looking to have one company manage and take care of all of their website needs – including website design, web hosting, e-mail hosting, and domain name management. After speaking with Jeremyn, we discovered that they had three domain names and an existing website. We worked with him to get the website copied over to our hosting services. In addition, we are currently in the process of transferring his domain names over to us in order to manage on their behalf. After getting the site copied over, there were a few changes and modifications that they wanted done to the site. We quickly worked through those and had those done in a few days – including the modification of their large header graphic to seamlessly remove some words. Jeremyn noted that they will also have us create them a new website sometime in the near future since the one they have is very old and needs a facelift. We appreciate the business from Jeremyn and look forward to creating a new website for his company! 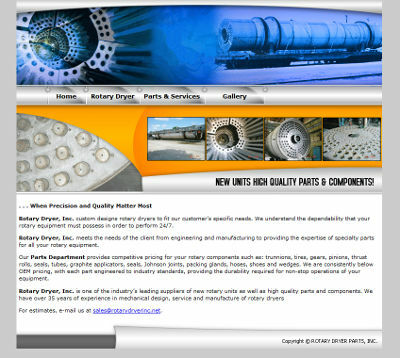 Rotary Dryer, Inc’s website is at rotarydryerinc.net.